This is a list of notable fish dishes. In culinary and fishery contexts, fish includes shellfish, such as molluscs, crustaceans and echinoderms. Fish has been an important source of protein for humans throughout recorded history. Canh chua is a sour soup indigenous to the Mekong Delta region of southern Vietnam. It is typically made with fish from the Mekong River Delta and additional ingredients. Ceviche is typically made from fresh raw fish cured in citrus juices, such as lemon or lime, and spiced with ají or chili peppers. Ikan goreng is a generic term that refers to various kinds of Indonesian and Malaysian dishes of deep fried fish or other forms of seafood. Lohikeitto is a common dish in Finland and other Nordic countries that consists of salmon fillets, boiled potatoes and leeks. Machher Jhol(Machha jhola) in an Odia style is a traditional Bengali and Odia spicy fish stew. It is in the form of a very spicy stew that is served with rice. Maachha Bihana is Fish egg curry in an oriya style. Paling in 't groen is a Flemish regional dish, mainly from the area along the River Scheldt between Dendermonde and Antwerp. The Dutch language name (literally 'eel in the green') refers to freshwater eel in a green herb sauce. Seafood birdsnest is a common Chinese cuisine dish found in Hong Kong, China and most overseas Chinatown restaurants. Tekwan is a fish soup of Palembang, Indonesia prepared with fishcake. 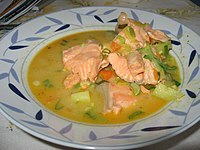 Ukha is a clear Russian soup, made from various types of fish such as bream, wels catfish, or ruffe. Machh bhaja is fish fried in mustard oil. It is a traditional Bengali and Oriya dish often eaten along with rice and other dishes. "Machh" means "fish" and "bhaja" means "fry" in Bengali/Oriya. Sorshe Ilish, a dish of smoked ilish with mustard-seed paste, has been an important part of both Bangladeshi and Bengali cuisine. This page was last edited on 20 April 2019, at 04:53 (UTC).